And since winged horses of Valkyries darted away to Valhalla forever, Dalecarlian horse has remained the guardian of Vikings’ traditions – painted folk toy, first mentioned in chronicles of 17th century. Dalecarlian horse serves as an amulet of non-touristic Sweden by saving from oblivion ancient fables and beliefs.
. In Scandinavian mythology horse is bound tightly with deities of solar pantheon: in days of solstice Swedes and Sami tribes would sacrifice stallions with white, sorrel and palomino coats, begging sun gods for rich harvest and not very hungry winter. It later turned out that the luminary wouldn’t go dark, should a symbolic picture of a horse instead of a soigné stud be committed to flames. With time carving of wooden horses lost its sacred meaning and turned into an amusement for peasantry. Upon hitting a daily target in number of chairs and tables, village craftsmen carved toy horses for kids out of offcuts of wood thus expressing belated gratitude to peasant’s toiler- horses. However, in household use animals were treated without mittens: what if they get spoiled! Church never approved of practices that reminded pagan past. First mention of favorite Swedish toy featured a wrathful speech of bishop Rodbekio aimed against “diabolic tool”. Craft prospered only in a distant northern province Dalarna that used to be called Dalecarlia: remote villages lost among forests lived in compliance with their own laws, luckily avoiding both secular and clerical authorities. At first horses weren’t painted or even colored, but there are few things one wouldn’t do to attract buyers: merchants form southern provinces traded toy horses for food and clothes. In 19th century toys started being decorated with kurbits – floral ornamentation eagerly sought in church paining. According to a biblical legend, Jonah the prophet saved himself from ungodly citizens of Nineveh under a kurbit bush that had grown at God’s dictation merely over a night. Over recent two hundred years domestic production of Dalecarlian horses hasn’t undergone almost any changes. Majority of souvenirs is produced at homes by family contracts: husbands carve, face and polishe intermediaries while wives cover them with decorative painting. Grannas A Olssons Handicraft Art Workshop is considered to be the largest manufacturer of this Swedish folk toy, it is located in forest village called Nusnäs in suburbs of Mora: annually about a hundred thousand horses comes off its workbenches. Automatization only impacted crudest stages of production process. Machines are applied solely to cut dummies out of northern poplar bars while precise fitting, sanding and polishing are performed exclusively manually. Later background primer and protective lacquer are applied to items for them to be left to dry and passed on under control of painters in two-three days. Ornamentation never repeats itself because use of stencils and clichés isn’t technologically provided for. On request a tourist can paint one of intermediaries with own hands to become an owner of an exclusive souvenir. To experts such craft centers as Sjöberg, Färnäs and Norra-Lindberg sound familiar. Samples of various styles are presented in Dalecarlian Horse Museum at Dala-Järna, founded at the initiative of Tomas and Margot Holst; at that the man of the family became famous as a skillful craftsman who carved the world’s smallest horse. 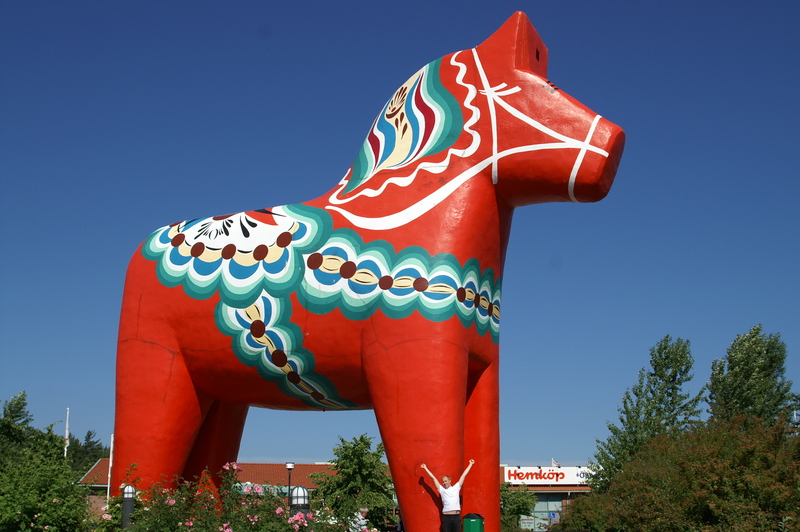 By the way, the largest wooden horse 13 meters high resides in Dalarna, too – it greets tourists entering Avesta. Origins of a toy can be easily spotted by nature of the pattern. Painting in the manner of Nusnäs settlement is considered canonic: flame-horse of orange-red coat in a festive horsecloth strewn with large blue-and-white flowers and openwork emerald-colored leaves ardently shakes finely-painted mane ready to break into a gallop to compete with the wind. 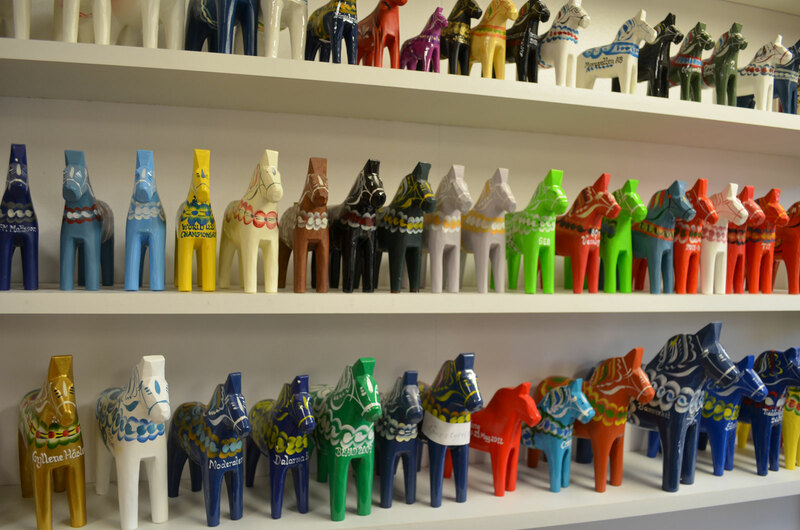 In Leksand they prefer goldish-yellow background, in Mora they opt for indigo colors while in Norrbärke carved horses are customary decorated with black-and-burgundy garlands. 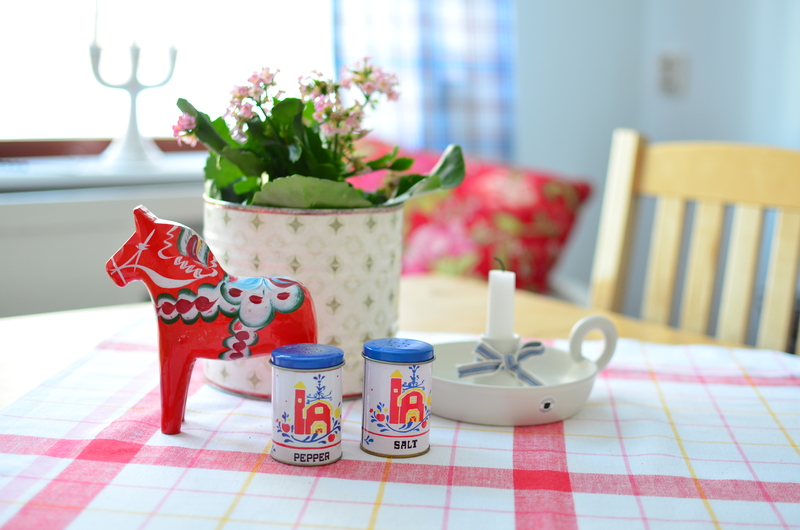 At souvenir shops of Lappish town Svatnes one can come across horses with black coat adorned with white-and-blue and blue-and-yellow patterns that symbolize friendship of Finland and Sweden. In early 18th century author’s works of Leif Chilstrem, tinted with ochre, enjoyed popularity – mimicking his idol Karl Larsson, carver drew inspiration in interiors of the painter’s villa. Modern designers actively experiment with ornamentation and coloring of a folk toy. Bertil Vallien Crafts Centre slightly refreshed traditional design of a horse from Söderbärke by letting snowflakes dance in rounds along yellow bodies. Anita Arvidsson-Åkerblom from Avesta elaborated two models with white grounding: Vattneshäst with red geometric pattern and Bronibeks with a blue mane and a toy saddle. Maud Ap and Agnetta Pavinen decorate their green horses with pictures of berries and a painter Karin Andersen from Bjoros, to the contrary, gets back to basics by leaving her “pets” non-colored for the sake of preserving wood texture. 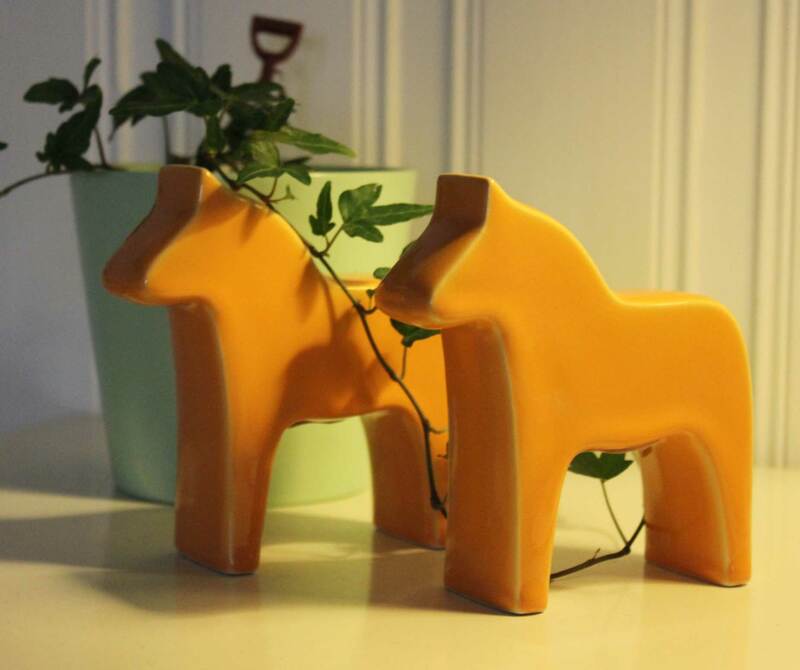 Many Swedes are fond of collecting Dalecarlian horses thus letting a fairy tale into everyday life. Bright herd on a shelf is so much different from seven porcelain elephants, loaded with guileless philistine luck. Who will gallop away on Bronze Horse from Stockholm this year? Quite soon, on the 8-th of November the official entrance of the most important Stockholm cultural center "Scandia" will be getting decorated with red road where the hundreds of cinema celebrities are going to honor the start of the prestigious "Stockholms filmfestival". We will tell today about the most prominent and crucial event in the world of cinema. The Embassy of Sweden to Ukraine and personally Ambassador Extraordinary and Plenipotentiary Martin Hagstrom spearheaded in Kyiv an evening dedicated to the song contest Eurovision – 2017 that is going these days in Ukrainian capital. One of the most ancient and cultural traditions in Sweden is the praising of Saint Lucia. The guests of official diplomatic service in the capital of Ukraine were able to join the customs accompanied the 13-th of December. Stockholm is one of the most expensive cities in the world. Nevertheless, its residents are satisfied with this status of the capital, and it is no wonder since an average salary in the city reaches USD2800... So, at first glance, it is a difficult task to have a good fun in the Swedish capital if you have just USD10 in your pocket. But this task is not hopeless once you stir your imagination and wind up your brain. So, our adventurous readers, follow us and we will show how to penetrate into the soul of the city without spending bank notes with your both hands! It is often compared to San Francisco due to abundance of bridges, water, hills and fish restaurants catering for every taste and pocket. There, even usual tap water is real mineral water, the city is awash with luscious leafy green spaces inhabited by undisturbed rabbits and hares... It may seem that this is a fairy tale abode, but in fact this is city of Gothenburg located in Sweden. Country with “Almost Identical Flag"
Sweden probably isn’t one of the most popular touristic destinations among Ukrainians. Our fellow countrymen far more willingly go to warm states or to more popular European capitals with easier access. Our today’s company, vocalist of “MYACH” band from Kyiv, Yuriy Rozenko, on the contrary, makes sure he visits the kingdom several times a year. First day in Sweden. You stand on Stockholm’s main square, absorbing cultural heritage through your eyes. Suddenly a thief runs by, grabs your bag from your hands and gets lost in back streets of the city. “All my money was there!” you shout in his direction. But a bully’s vanished into thin air. What is the first thing you do? Rule 1 – no panic. Rule 2 – pull yourself up and… get a job!